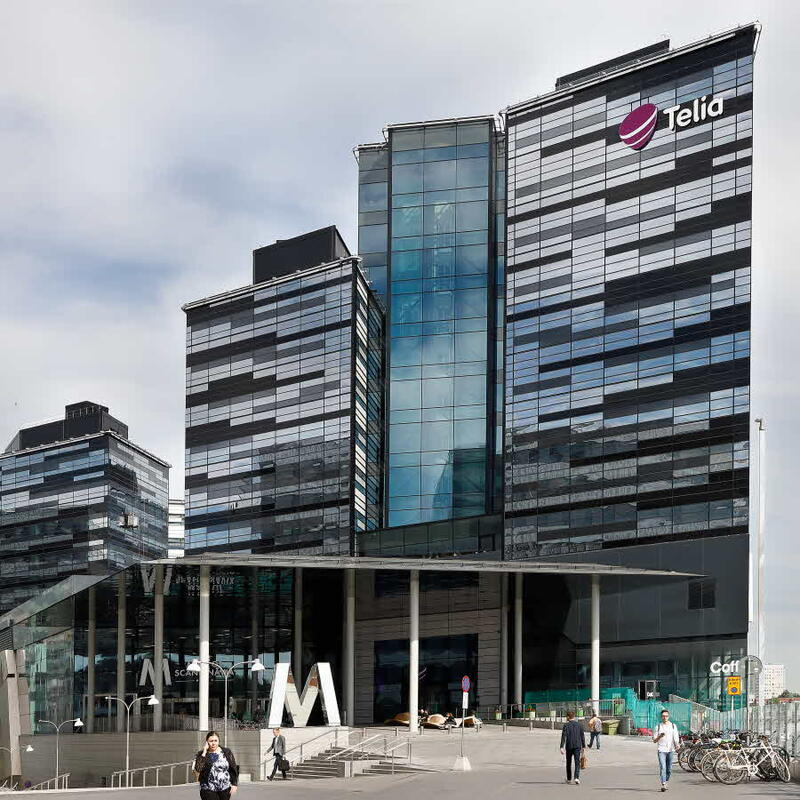 In 2016 Telia Company moved into its new, spectacular headquarters at Stjärntorget – a stone’s throw from Arenastaden’s commuter train exit. All materials and solutions have been selected with the utmost care in order to suit Telia’s activity-based working model. The property is one of the highest buildings in the area. Visitors and employees find the fantastic view and the glazed courtyard fascinating. The facade of the property consists of a mosaic of various types of glass: clear glass, screen-printed glass, mirror glass and thick facade glass. The facades are glazed from table height and upwards. Depending on the position of the sun, the surface changes over the course of the day, like a beautiful kaleidoscope. 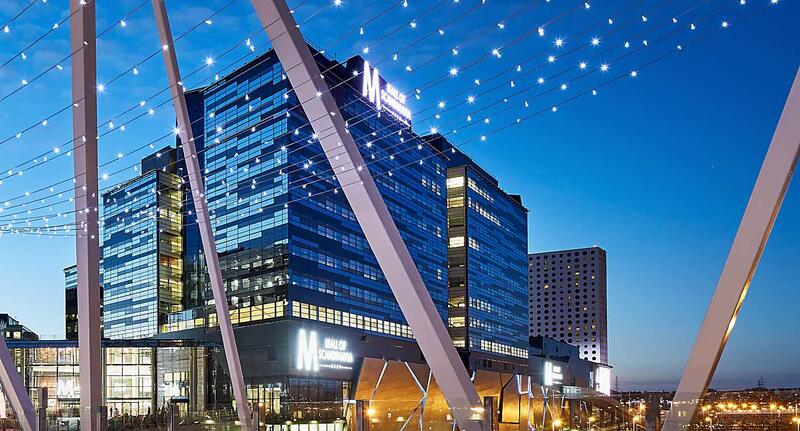 The Telia building is connected by an inner plaza that with its three atriums is elevated by some 25 metres, above Mall of Scandinavia. The building is home to shared premises such as conference facilities and meeting rooms, training venues, cafés and restaurants. The top floor of the offices is 58 metres above the ground. Before visitors enter the office floor, they will be enchanted by the view of the atrium and Arenastaden from the lifts. The facade consists of mosaic and various types of glass, giving different impressions during the course of a day depending on the position of the sun. All materials and solutions have been selected with the utmost care in order to suit Telia’s activity-based working model. For example, there are quiet rooms for individual work, meeting and project rooms of various sizes, touchdown spaces, sofa areas and standing desks. The flexible office floors have a ceiling height of 2.80 metres throughout. Reflex Arkitekter are behind the design of the property. The office satisfies requirements for the environmental classification system BREEAM-SE, Excellent. The building’s flexible layout and space-efficient office premises also mean less environmental impact. Toilets and taps are low-flow to cut water consumption. There are solar panels on the roof. Also, some of the roofs are covered in vegetation, known as green roofs. This gives them an attractive appearance and helps ensure biodiversity. All the materials used have been chosen for their lifespan, maintenance requirements and general environmental footprint. There are good opportunities for sorting waste into several different categories. To make things easier for all the cyclists, there are also covered bicycle parks that are secure and lockable.